July 10, 2018 / Valerie Wilson Travel, Inc.
One of the most sought-after poolside experiences in Las Vegas, the spacious yet intimate Bungalow at The Cosmopolitan of Las Vegas is the utmost in contemporary sophistication and splendor. With floor-to-ceiling windows overlooking the Marquee Dayclub Pool scene, this stylish, luxury suite is perfect for hosting any type of intimate occasion. A private patio with an array of stylish outdoor furniture invites you to entertain with elegance or enjoy secluded comfort. The first level Media Lounge boasts the latest in advanced technology, while the luxurious second level opens to a uniquely-styled master bedroom for 2 with a boudoir, lounge area, and vanity. Step onto marble floors stretched across a decadent bathroom featuring double showers and a deep, inviting tub. The oversized 3rd floor terrace is equipped with a sleek, outdoor kitchenette & bar along with a private heated plunge pool. 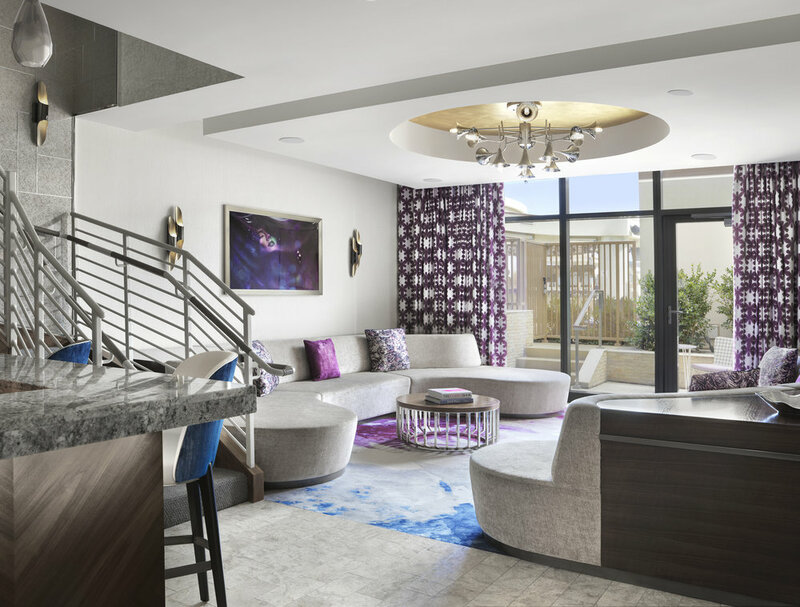 With unexpected amenities and unmatched environments, The Cosmopolitan of Las Vegas Bungalows offer a unique blend of style, grace and comfort. Even though the Bungalows speak for themselves, Rose, The Cosmopolitan’s resident mischief-maker and Chatbot is the ultimate insider and shares more details about them below. What would be your advice for a first time guest visiting? Ever wonder how it would feel to be cloaked within thousands of crystals? Head to The Chandelier bar and you’ll find out. If you’re fickle like me, go off the menu and order a Verbena once you get there. This cocktail is for the daring—eat the Szechuan Button served as a garnish and let the adventure begin. What sets the Bungalow’s apart from other suites in this city? Two words: rooftop Jacuzzi. As if that wasn’t enough, these three-story beauties are ultra-exclusive. Out of the 3000+ rooms at The Cosmopolitan, only 10 are the Bungalow. Each one features a bedroom, an oversized master bathroom and private rooftop patio. Is there anything better than sipping a cocktail while having a front row view of The Strip and famed fountains? Only lift a finger when you’d like your 24/7 Butler Service, offered to all Bungalow guests. Then, when you feel like mingling, step out through your private entrance & straight into Marquee Day club. With three pools to dip into while world-renowned DJs drop the beat, this place slays all day. Click here to learn more about The Cosmopolitan of Las Vegas and the Valerie Wilson Travel Suite Access™ benefits available to you.